Suzuki's got something though that's definitely going to make you rethink things if you're in the market for an ultra-compact: the Suzuki SX4 Crossover. 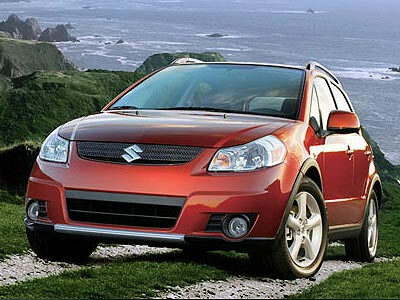 The SX4 Crossover is the hatchback adaptation of the orginal SX4 4-door sedan, launched in 2008 and now called the SX4 Aero.The end result is an SX4 that's far sportier boasting a honeycomb-type grille, and fender arches that that lend the car a masculine appeal despite its size. The roof rails, 16-inch alloy wheels, and halogen fog lamps add some more excitement to a car that was already pretty sporty-looking to begin with. The car also boasts better ground clearance (175 mm in total) compared to the SX4 Aero, which means that you won't have to worry about the humps in your village that are just too eager to slow down passing cars. While it's extremely compact, the SX4 Crossover does boast excellent headroom both in the driver's seat and the back row, so tall people need not worry about bumping their heads. The car also has ample cargo space, accomodating up to 992 liters of cargo volume with seats folded down. The same though can't be said for the leg room the car has, which, to say the least, is far too small for our preference. The car's instrument cluster and dashboard area is clean and simple, just the way we like in this type of car. Its audio system is noteworthy too, featuring CD and MP3 compatibility, and channeled through a solid 8-speaker system. The Crossover is equipped with a 1.6 liter 16-valve DOHC engine with variable valve timing that produces a good 110hp, and a four-speed automatic transmission. It's a jitterbug that shows its bite in the higher RPM range, and for a car this size, it has admirable power, we must say. As for safety, the car boasts disc brakes with ABS on all four wheels, EBD and dual airbags fitted as standard. It's perfect for city driving, as it's very agile yet stable, and can fit in the tightest of parking spaces. At PhP899,000, the SX4 Crossover does have a little extra competition (aside from the other subcompacts mentioned above) in the form of entry-level sedans such as the Corolla and the Civic. But if you're liking what you see here, the Crossover is still a terrific choice, no doubt.